Can you believe it – # 050……. Sunny Challenges & Creations celebrate 12 months on this sketch. Who would have ever thought that we would still be going? Anyhow, Kris has set our challenge this week & we have a Technique to go with the sketch. This week we had to do the Reflection or Mirror Image Technique. If you haven’t had a go at this fun technique, then pop on over to Sunny Challenges for a tutorial on how to do it. For my card, I sort of started from the inside out. I had an idea forming in my head, but couldn’t work it out to start the card, so thought it best to play & think while doing the inside first. Do you do your cards that way? I often do & always amazes me how it sort of comes together in the end. I do have another card which I was going to post instead of this one, but will post it later on in the week, so be sure to pop back to check it out! 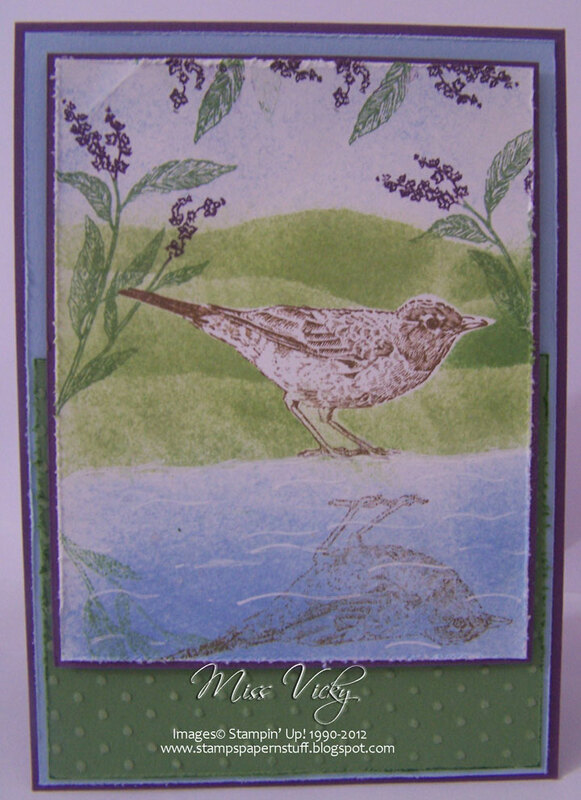 My image was stamped onto the piece of Whisper White Cardstock in Soft Suede Ink. I created a mask for my bird & adhered it to the top of my stamped image. Using my Sponge, the hills were sponged in Certainly Celery Ink, while the sky was sponged lightly with Bashful Blue. 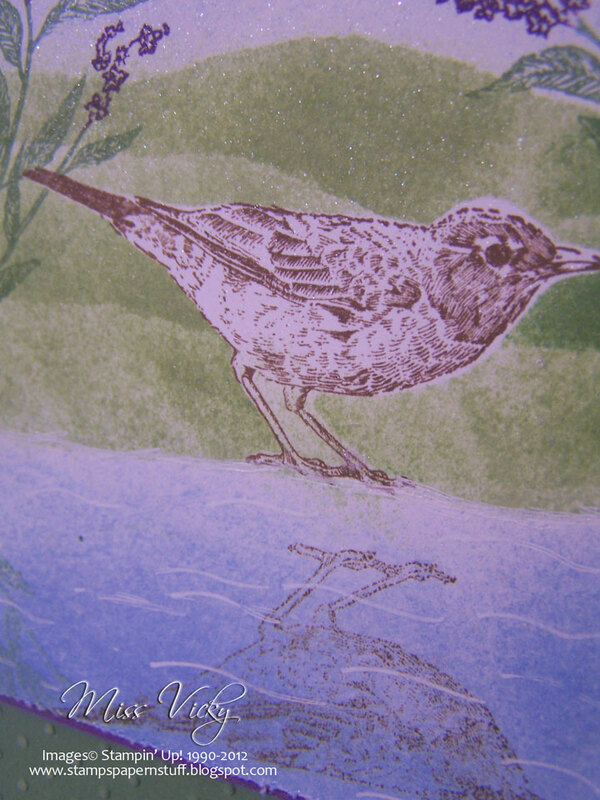 The same went for the water, except as I got towards the bottom of the water I sponged it a bit darker so that it washed some of the bird’s reflection. Once I was happy with the sponging, the mask was taken off the bird. 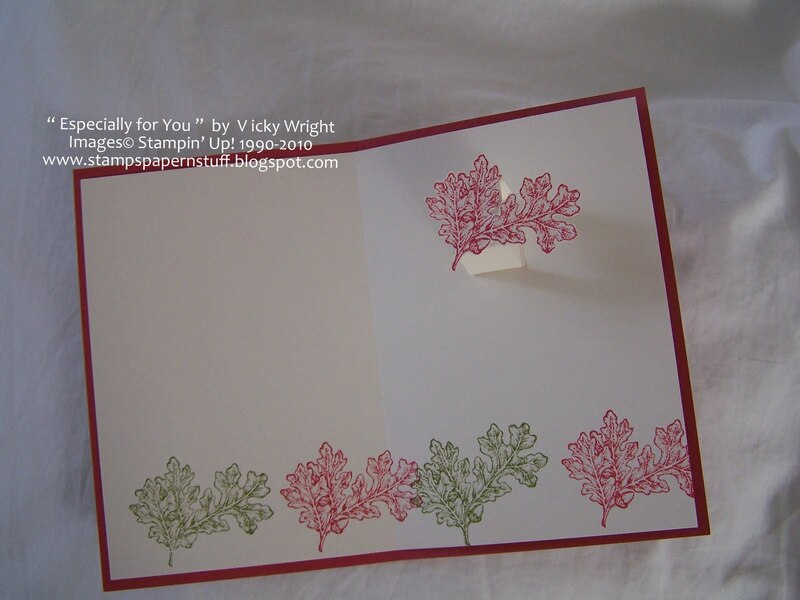 The images around the edges were inked with my Stampin’ Up! 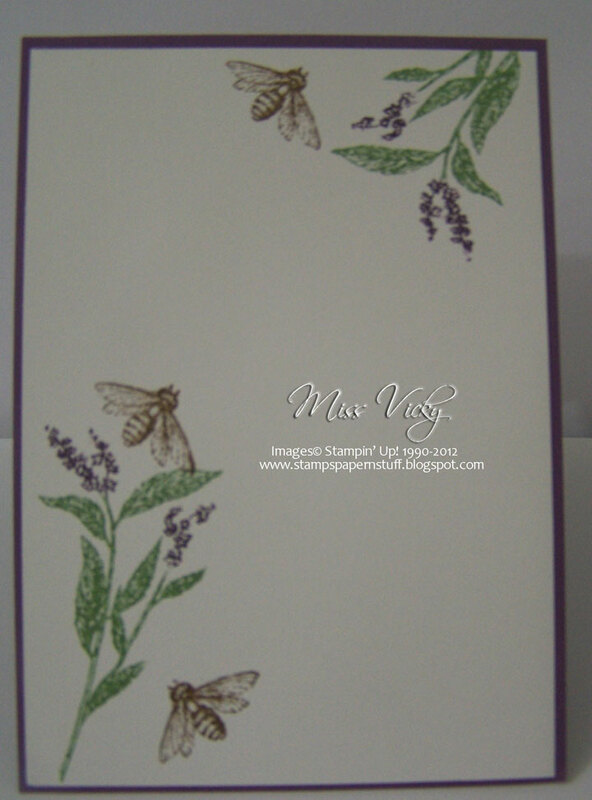 Markers -Wild Wasabi & Perfect Plum prior to randomly stamping around the card. To add a bit of dimension to the water, I drew a few randomly lines with my White Gel Pen. This sort of looks like it is the ripples in the water. I did the same along the water’s edge. I went around the edge with my Distressing Tool & finally sprayed the lot with Vanilla Shimmer. It did start out with just the water so that it would give it a bit of a gleam, but ended up going over the whole card, but that it ok. The Wild Wasabi piece went through the Bigshot using Perfect Polka Dots Embossing Folder & adhered to the piece of Bashful Blue Cardstock with Snail Adhesive & then finally to the Base Card – Perfect Plum. 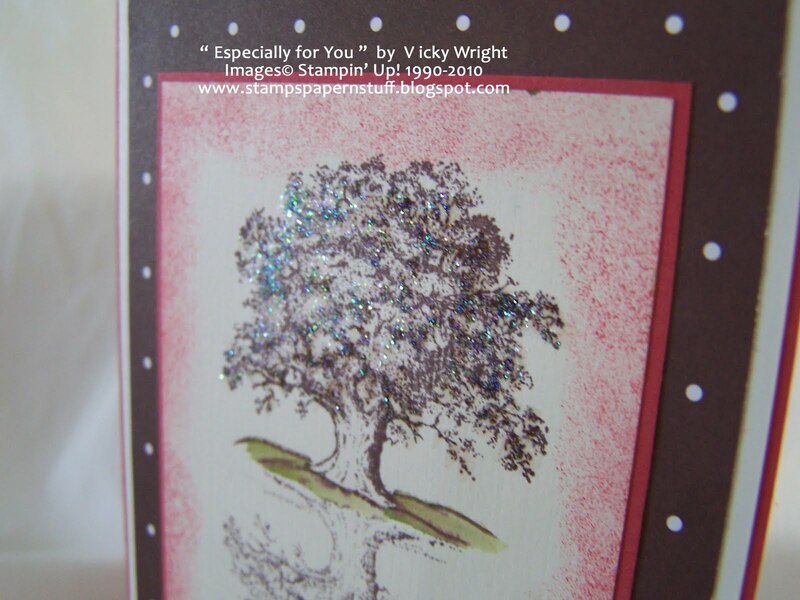 The sponged piece was adhered to the card with Stampin’ Dimensionals. I have gone back to the softer colours of late. Don’t forget to pop on over to Sunny Challenges & Creations & check out what both Gwen & Kris have created. We would love for you to join us & help celebrate our BIG 50!!!!! 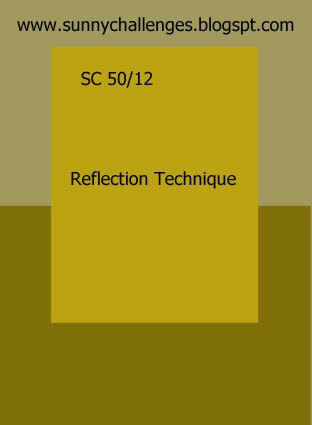 This is the card we made yesterday at our Tech Class – Reflection Stamping or Mirror Image. It is a very fun technique to do & even doing the most basic stamp can have your card looking stunning! 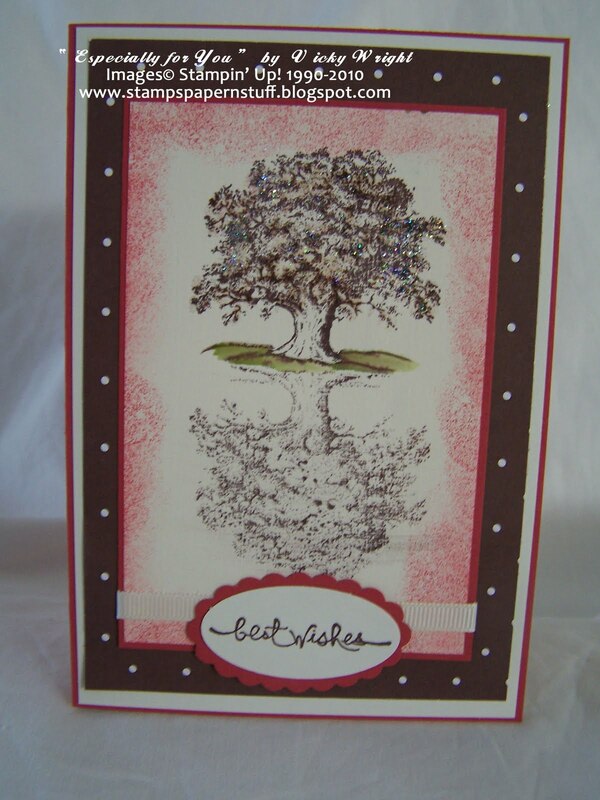 In fcat, we did a couple of different techniques to this card – Dazzling Diamonds, Aqua Painting, Sponging & for the inside – Pop-Up, but check them out for yourselves…. This is a great Stamp Set with so much potential – can you see it being used for a Christmas, Sympathy, General card or as in this case a Male Card? The list is endless! If you would like to start learning techniques & having fun & meeting new friends, please join us for our next class – Wednesday, 30 June. We would love you to join us! All you are required to bring is your own adheives! Can’t make the class, then why not order one on line & I will post you all consumables, along with coloured photos & step by step instuctions on how to make this card!